Shrove Tuesday, the annual pancake feast, takes place on February 24th. 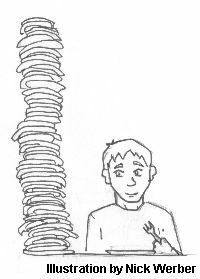 This night before the start of the Lenten fast, commmonly known as "pancake night," is a time when many still engage in the archaic practice of making, tossing and eating mountains of pancakes. Over-indulgence is expected, if not demanded, and children will come into school on Ash Wednesday boasting of their pancake-eating feats. Generally, large, thick pancakes are simply sprinkled with lemon juice and sugar, rolled into a cigar shape and eaten as a sweet. The survival of this old custom is interesting, since the rigorous Lenten fast is not as widely observed as it once was, though a fair number of people still abstain from alcohol, cigarettes and candy for Lent. Shrove Tuesday, however, is as popular as ever. The ritual is linked to the great European carnival tradition of Mardi Gras ("Fat Tuesday") when people ate as much fat and meat as possible, knowing that these were forbidden for the next forty days. From the early Middle Ages, the Catholic Church forbade the consumption of meat, eggs and dairy produce during Lent. On Shrove Tuesday, thrifty housewives made use of the perishable eggs, milk and butter in the preparation of pancakes. One social aspect of the night, however, has fallen into disuse - the link between Shrove Tuesday and the romantic fortunes of the unmarried. Traditionally in Ireland, marriage was forbidden to take place during Lent, so in the weeks before Christmas and "Shrovetide," as it's sometimes called, matchmakers busily tried to find suitable candidates for marriage before Ash Wednesday arrived. Households left with unmarried daughters on Shrove Tuesday tried to imbue them with better luck for the coming year by allowing them to toss the first cake. Their pancake-making skills, for better or worse, were seen as an indication of their romantic chances for the next year.